17 April 2013 - The effect on Liverpool of signing expensive players in the first year of ownership by the Boston-based Fenway Sports Group [FSG] has been revealed, with accounts showing the club lost £40.5m in the 10 months to 31 May 2012. During the period, which covered Liverpool's transfer activity in the August 2011 and January 2012 windows, the club's biggest signings were José Enrique, from Newcastle United, and Sebastián Coates, from Nacional, but the wages still accounted for 70% of the club's total income. The wage bill, £109m for the 10 months, equating to £131m over a full year, was very close to the £134m Liverpool paid in the previous year, and included the salaries of Andy Carroll, Luis Suárez, Jordan Henderson, Stewart Downing and Charlie Adam, all signed in the early months after FSG's October 2010 takeover. The accounts disclose that Liverpool paid £9.6m in termination payments "to former employees ... including the change in coaching staff", which relates to FSG's sacking of several people last May, including Kenny Dalglish and his assistants. Liverpool's managing director, Ian Ayre, argued that the club is in a transitional period and has now "implemented a new transfer strategy" which aims to "bring in talented players on sensible contracts". 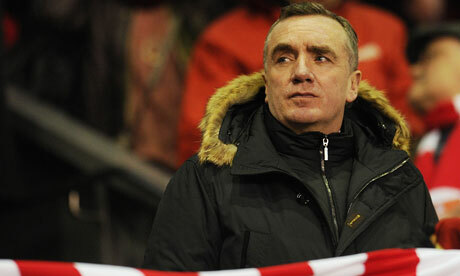 Ayre claimed that despite the £40.5m loss and increase in net debt to £87m from £65m in 2010-11, Liverpool are being prudent. "We've done it in a frugal way," he said, explaining that players have been put on "the right contracts", with payment in instalments both for them and the selling clubs. "It's important that we have that sort of prudent approach as we want to create sustainability for the club, he added. The £40.5m loss followed another of £49m for the year to 31 July 2011, covering FSG's first months since its takeover from the former owners, US-based Tom Hicks and George Gillett. Although John Henry, principal of FSG, is a confirmed advocate of financial fair play rules, Liverpool, if they repeat these figures next year, would fail the new regulations introduced by the Premier League, which limit annual losses to £35m. FSG has been loaning money to Liverpool in an effort to improve the club's financial position. During its first months, FSG lent £30m, then in the 10 months to 31 May, the club repaid FSG £8m. In August, FSG loaned a further £47m to the club, which was used to pay off bank borrowings, including £38m owed in loans relating to the club's work on its stadium plans. In October, FSG clarified that it intends to expand Liverpool's stadium at Anfield rather than build a new stadium on Stanley Park, which had been planned for a decade. The accounts show again why Liverpool are seeking this expanded capacity, to make more money from fans and thereby narrow the income gap on Manchester United, Arsenal and the other highest-earning Premier League clubs. Liverpool's income was £169m for the 10 months to 31 May 2012, a period covering the full 2011–12 season. Matchday income, £42m, was lower than that from TV and media rights, and commercial revenue. By comparison, Arsenal's turnover for 2011-12 was £243m, while United's was by far the highest of any English club at £320m.